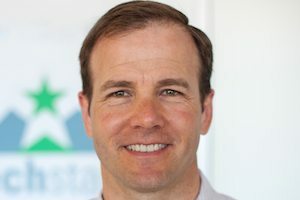 When I talked with Techstars Chicago’s managing director Troy Henikoff in January about his upcoming visit to Milwaukee, he readily admitted that he didn’t know as much about Wisconsin’s tech startup scene as he would like. I caught up with Henikoff again Wednesday night at the event hosted by Startup Milwaukee to ask him what he gleaned about the environment here after a day’s worth of one-on-one sessions with Wisconsin startups. His conclusion? Well, basically, Wisconsin startups aren’t that different from those in Chicago—or anywhere else, for that matter. They’re all trying to fine-tune their business models, find the right mentors, and connect with customers, he said. Multiple entrepreneurs asked Henikoff about best practices for raising funds, a question he often gets from participants in his Chicago startup accelerator, too. Although Chicago might have a larger pool of investment dollars to tap into than Wisconsin, it’s not any easier for Windy City startups to actually secure the money, he said. “The reality is, at the end of the day, all startups have a lot of things in common,” Henikoff told me before giving a presentation to a group of more than 200 that packed Startup Milwaukee’s downtown co-working space, 96square. The event was co-sponsored by Golden Angels Investors, a group based near Milwaukee that has invested in Techstars Chicago’s fund. After networking over pizza and craft beer, attendees heard the story of how Henikoff started a Chicago-based payroll software provider, SurePayroll, in 1999. Despite the terrible timing of launching on the eve of the tech bubble bursting, Henikoff and his team overcame several setbacks and grew SurePayroll into a successful business that sold to Paychex for $115 million in 2011. The crowd also heard from Techstars Chicago director Steve Farsht and Dale Emmons, co-founder and CEO of Vidmaker, a Madison, WI, firm that built an online video-editing platform and graduated from the Techstars Cloud program in San Antonio, TX, in 2012. Earlier in the day, Henikoff and Farsht each met with nine Wisconsin tech startups in half-hour sessions to break down their businesses and offer advice. But scouting for Techstars Chicago’s 10-company summer program wasn’t the bottom line for the Milwaukee trip, Henikoff said.